Western, chic, and modern, wear this Stud and Rhinestone Belt with any outfit whether you're going riding or walking around town. It's intricate with its beautiful cowhide appearance with a western scroll design that consists of a flowing pattern of studs and rhinestones. 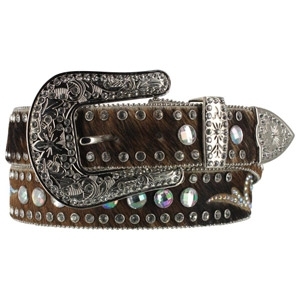 It has concho details that make the belt sparkle and shine.